In a broad interview for “Tages-Anzeiger” Jacques Herzog of Basel explains why his team hasn’t taken into account bidding for the new Zurich stadium design. “We don’t want to build as many stadiums as possible, only the very best. 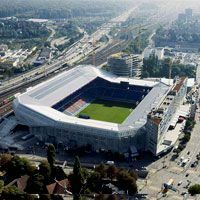 In Siwtzerland St. Jakob Park is our stadium, also because we have a special relationship with the club”, said the 63-year-old architect. Currently there are three stadiums in the portfolio of Herzog and de Meuron, of which only the one in Belgium hasn’t received global recognition. Remaining two, Allianz Arena and Beijing National Stadium are known even to people not interested in sports. “We’d like to build one stadium in every country, where football is of great significance: England, Spain, maybe Brazil. But two or more stadia in one place makes no sense”, said Herzog, opposing the practice of his competition Populous or GMP Architekten, who are sometimes accused of copying their own ideas in various locations. Herzog and de Meuron were rejected in the bid to redesign Camp Nou several years back, but in the end none of the designs from that time were implemented. Now the team still stands a chance for redevelopment of Santiago Bernabeu as one of three finalist bidders. Unofficial sources say, however, that their chances are slim. While speaking of the Zurich stadium, Herzog admitted the selected design is a very good one and the public should support it in the vote on September 22. But while he supports the sole design, financing model that sees the city getting into debt is wrong in his eyes.